Quickly master English writing skills with THE LEAST YOU SHOULD KNOW ABOUT ENGLISH: WRITING SKILLS, FORM C, Eleventh Edition. 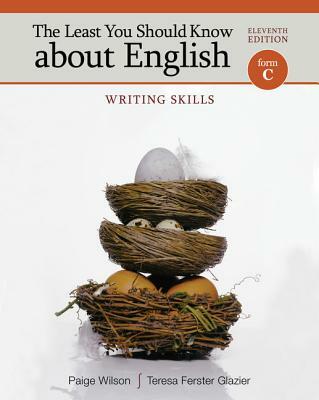 Brief and uncomplicated, this text has helped students learn the basics of English writing for over thirty years with its clear, concise concept explanations and useful, relevant corresponding exercises. Topics include spelling, word choice, sentence structure, punctuation, paragraph and essay writing--as well as more advanced skills such as argumentation and quotation. Check your work easily with exercise answers located in the back of the book, making it an excellent writing resource even after the course has ended. Available with InfoTrac Student Collections http: //gocengage.com/infotrac.